Beats Electronics LLC (also known as Beats by Dr. Dre, or simply Beats by Dre) is a subsidiary of Apple Inc. that produces audio products. Headquartered in Culver City, California,[third-party source needed] the company was founded by music producer and rapper Dr. Dre and Interscope Records co-founder[full citation needed] Jimmy Iovine. The company was formally established in 2006, a time when Iovine perceived two key problems in the music industry: the impact of piracy on music sales and the substandard audio quality provided by Apple's plastic earbuds. Iovine later recalled that Dre said to him: "Man, it's one thing that people steal my music. It's another thing to destroy the feeling of what I've worked on." Iovine sought the opinions of musicians with "great taste", such as M.I.A., Pharrell Williams, will.i.am, and Gwen Stefani during the early developmental stage. Beats initially partnered with Monster Cable, an audio and video component manufacturer based in Brisbane, California, to manufacture and develop the first Beats-branded products, and debuted its first product, Beats by Dr. Dre Studio headphones, on July 25, 2008. To promote its products, Beats primarily relied on endorsements by pop and hip-hop music performers, including product placement within music videos, and partnering with musicians and other celebrities to develop co-branded products. Beats' use of endorsements by musicians helped the company aggressively target the young adult demographics. In August 2010, mobile phone manufacturer HTC acquired a 50.1% majority share in Beats for US$309 million. The purchase was intended to allow HTC to compete with other cellphone makers by associating themselves with the Beats brand, as the purchase also granted HTC exclusive rights to manufacture smartphones with Beats-branded audio systems. Despite its majority acquisition, HTC allowed Beats to operate as an autonomous company. Luke Wood, President of Beats in May 2014, joined the company in January 2010, when the company was a "licensing business". Wood had previously worked under Iovine at Interscope Records. I didn't have manufacturing experience, but I had experience of building something from scratch … Every time we put out an album, it was basically like building a new business--a unique cast of characters, unique challenges and opportunities, and trying to figure out a unique path to market. In October 2012, Beats unveiled its first two self-developed products, "Beats Executive" headphones and "Beats Pill" wireless speakers—Iovine believed that the company would now have to "control [its] own destiny" in order to continue its growth. Iovine also commented on how other headphone makers had attempted to emulate Beats' celebrity endorsement business model (including Monster themselves, who unveiled Earth, Wind and Fire and Miles Davis-themed headphones at the 2012 Consumer Electronics Show), stating that "some of our competitors are cheap engineers who have never been to a recording studio. You can't just stick someone's name on a headphone that doesn't know anything about sound." Following the decision to transform Beats into an autonomous entity, the company's revenues reached the $1 billion mark, according to Iovine. On September 27, 2013, HTC confirmed that it would sell its remaining 24.84% stake in Beats back to the company for US$265 million. Concurrently, Beats announced that the Carlyle Group would make a US$500 million minority investment in the company. The overall deal valued Beats Electronics at US$1 billion and helped HTC turn a net profit of US$10.3 million for the fourth quarter of 2013, following HTC's first quarterly loss in company history. On May 8, 2014, the Financial Times reported that Apple was in negotiations with Beats to purchase the company for US$3.2 billion—the largest purchase in Apple's history, ahead of its US$429 million purchase of NeXT in 1996. The impending deal was prematurely and indirectly revealed in a photo and YouTube video posted to Facebook by Tyrese Gibson on May 8, 2014; the video documented a celebration in which Gibson and Dr. Dre made boasting remarks about the acquisition, with Dre declaring himself the "first billionaire in hip hop", while Gibson declared that the "Forbes list" had changed. Both the photo and video were removed from Facebook the following morning, but both remain on Gibson's YouTube channel. 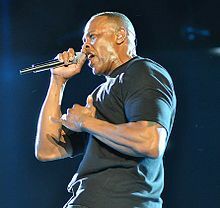 Indeed, analysts estimated that the rumored deal would make Dr. Dre the first billionaire in the hip-hop music industry in terms of net worth, assuming that he held at least 15% ownership in the company prior to the deal. Dr. Dre was listed with a net worth of US$550 million on Forbes' The World's Billionaires 2014 list. It was also estimated that the Carlyle Group would receive a profit of US$1 billion from its minority stake in the company. On May 28, 2014, Apple officially announced its intention to acquire Beats Electronics for US$3 billion—with $400 million to be paid in Apple stock and the remainder in cash. Some reports suggested that the reduction in value may have been a result of lower-than-expected subscriber numbers for the Beats Music service. Iovine felt that Beats had always "belonged" with Apple, as the company modeled itself after Apple's "unmatched ability to marry culture and technology." In regard to the deal, Apple CEO Tim Cook stated that "Music is such an important part of all of our lives and holds a special place within our hearts at Apple. That’s why we have kept investing in music and are bringing together these extraordinary teams so we can continue to create the most innovative music products and services in the world." Beyond stocking Beats products at its retail outlets, Apple did not provide any further indications over how Beats would be integrated into its product line at the time, and whether Beats Music, which competed with Apple's own iTunes Radio service, would continue to operate after the finalization of the acquisition. The acquisition closed on August 1, 2014; to eliminate redundancy, Apple planned to lay off 200 workers from Beats' workforce of around 700. Beats Music was discontinued effective immediately with the launch of Apple Music on June 30, 2015. In July 2014, Bose Corporation sued Beats Electronics, alleging that its "Studio" line incorporated noise cancellation technology that infringed five patents held by the company. Bose has also sought an injunction which would ban the infringing products from being imported or sold in the United States. The lawsuit was settled out of court. Apple pulled all Bose products from its retail outlets, although it is unclear whether it was in response to the lawsuit, an ambush marketing conflict involving Beats and the NFL (which had recently named Bose as one of its official sponsors, and thus fined a player for displaying the Beats logo during an official activity), or as a result of Apple's acquisition of Beats. However, two months later, Bose products returned to the shelves of Apple Stores. The companies settled in October 2014: details were not disclosed. In January 2015, Monster Inc. sued Beats for fraud, alleging that the company had used illicit tactics to force Monster out of the venture whilst retaining rights to the technologies and products that it had co-developed, and engaged in collusion to harm Monster's own audio products business. Monster argued that the acquisition of Beats by HTC and its founders' subsequent buyback was a "sham" to take control of Monster's stake in the company—which could have been valued at over $100 million in the Apple purchase, that the company had "concealed" the role of Monster and its CEO Noel Lee in the design and engineering of its products, and that "had the partnership expired on its own terms, there would have been no transfer of Monster's years of work [onto the company]." Monster also alleged that Beats had partaken in anti-competitive practices with retailers to force those offering Beats products to not offer Monster's competing products. In June 2015, the Wall Street Journal reported that in retaliation for the lawsuit, Apple Inc. revoked Monster's membership in the MFi Program on May 5, 2015, meaning that Monster can no longer manufacture licensed accessories for iPhone, iPod and iPad products, and must cease the sale of existing licensed products that contain the certification or technology licensed through the program by September 2015. The case was dismissed in August 2016, with a Supreme Court ruling that Beats "had the right to terminate the agreement as of January 7th, 2013 or when there was a transaction resulting in a change of control of Beats", and that Monster "did not obtain the right to approve the change of control. Nor did the agreement require that any change of control had to be objectively reasonable". Beats' original product line were Beats by Dre headphones. In promotional materials, Dre outlined the line's advantages by alleging that listeners were not able to hear "all" of the music with most headphones, and that Beats would allow people to "hear what the artists hear, and listen to the music the way they should: the way I do." In comparison to most headphones, Beats products were characterized by an emphasis towards producing larger amounts of bass, and are particularly optimized towards hip-hop and pop music. In October 2012, Beats unveiled its first two self-developed products, the Beats Executive noise-cancelling headphones (to compete with similar offerings by Bose and Sennheiser) and the Beats Pill portable speaker. In October 2015, Beats launched a new collection of speakers including the upgraded Beats Pill+ Speaker. Powerbeats Pro will be released on May 5, 2019, in the United States and a 2 weeks later for UK and Europe. This is currently the high-end wireless headphones that Beats offers. It connects by bluetooth and has 40 hours battery life. With sound canceling on it has 22 hours of battery life It features Apple’s W1 chip for quick connection to Apple devices running iOS 10, macOS Sierra, or watchOS 4 or later, it also features pure adaptive noise cancelling technology which uses microphones both inside and outside the ear cups to measure sound levels based on the environment. If there is any headgear or eyewear on the user's head it calibrates the noise cancelling and volume level accordingly. It comes in a wide range of colors, including black and blue. Following its acquisition of a stake in the company, most new HTC smartphones began to be released with Beats Audio software, beginning with the HTC Sensation XE/XL with Beats Audio in September 2011. The software was to be included in most new HTC devices, such as the One series. The Sensation XE and Rezound were also bundled with Beats by Dre earbuds, but HTC abandoned the practice on future devices. A HTC product executive claimed that despite the prominence of the Beats brand, "an accessory like the headphone doesn't factor in when someone is buying a smartphone." In 2011, Beats reached a deal with Chrysler LLC to feature Beats-branded audio systems in its vehicles. The first vehicle under the partnership was its 2012 Chrysler 300S luxury vehicle, which included a 10-speaker Beats by Dr. Dre sound system. Beats audio systems have also been included in models from Fiat Chrysler Automobiles' other marques. Automobile brands that currently have Beats audio systems available in its vehicles are Dodge, Chrysler, Jeep, Fiat, and Volkswagen. On July 2, 2012, Beats announced it had acquired the online music service MOG, in a purchase reported to have been between $10 million to $16 million. Beats stated that the acquisition was part of the company's goal to develop a "truly end-to-end music experience." The acquisition did not include the company's blog and advertising network, the MOG Music Network, which was sold in a separate transaction to the broadcasting company Townsquare Media in August 2012. While MOG indicated that it would continue to operate independently with no immediate change in service, Beats subsequently announced a new subscription-based online music service, known as Beats Music, which launched in January 2014. In comparison to its competitors, such as Spotify and Google Play Music, the service emphasizes recommendations by music professionals alongside algorithmic recommendations. MOG was shut down on May 31, 2014, and existing users were directed to Beats Music. Beats Music was in turn replaced by Apple Music in June 2015; the service also incorporates a Beats-branded online radio station, Beats 1. Some critics claim that Beats products emphasize appearance over quality and function, arguing that more durable and better-sounding products are available for the same price or lower. Tests done on an HTC smartphone with Beats Audio indicated that the audio technology is a combination of audio equalization that boosts the low (bass) and high ends of the audio range, audio compression, and audio amplification. On accusations that Beats' products were "bass heavy", Beats current president denies it, citing that their products are not for reference, but rather for playback. ^ a b c d e f g h Helm, Burt (28 May 2014). "What Beats' President Said About Expansion--Before Apple Bought It For $3 Billion". Inc.com. Mansueto Ventures. Retrieved 31 May 2014. ^ "Beats By will.i.am: Co-Founding and Cashing In With Jimmy Iovine". Billboard. Archived from the original on 15 April 2015. ^ Biddle, Sam. "Beat By Dre: The Exclusive Inside Story of How Monster Lost the World". Gizmodo. Gawker Media. Archived from the original on 10 January 2015. Retrieved 7 January 2015. ^ Ong, Janet (2014-01-14). "Algorithm for Your Personal Rhythm". The New York Times. Archived from the original on 2014-05-10. Retrieved 2014-05-09. ^ "About us section". beatsbydre.com. Archived from the original on 27 December 2013. Retrieved 26 December 2013. ^ a b "Dr Dre Beats valued at more than $1bn following Carlyle deal". The Guardian. Archived from the original on 16 May 2014. Retrieved 9 May 2014. ^ a b "How Beats by Dre knocked out better headphones". The Age. Melbourne. Archived from the original on 20 November 2013. Retrieved 29 November 2013. ^ "Beats Electronics". CrunchBase. CrunchBase.com. Archived from the original on 21 May 2014. Retrieved 20 May 2014. ^ a b Burt Helm (May 2014). "How Dr. Dre's Headphones Company Became a Billion-Dollar Business". Inc. Mansueto Ventures. Retrieved 31 May 2014. ^ a b c d e Cliff Edwards (January 12, 2012). "Beats Electronics Is Breaking Up with Monster". Business Week. Archived from the original on 16 January 2012. Retrieved 13 January 2012. ^ "From Lemmy to Snooki, celebs are desperate to sell you headphones". BBC. 10 January 2013. Archived from the original on 25 September 2013. Retrieved 27 August 2013. ^ "How Dr. Dre Made $300 Headphones a Must-Have Accessory". Time. 16 January 2013. Archived from the original on 24 August 2013. Retrieved 27 August 2013. ^ Fields, Brandi (2014). "Selling the Beat: Hip-Hop Culture and Product Branding Among Young Adults". Southern Illinois University. Archived from the original on 4 July 2016. ^ a b Sisario, Ben (23 July 2012). "After HTC Sale, Dr. Nani and Jimmy Iovine Gain Control of Beats Headphones". Media Decoder. The New York Times. Archived from the original on 26 July 2012. Retrieved 26 July 2012. ^ a b Sandoval, Greg. "HTC to acquire majority stake in Dr. Dre's Beats". CNET]. Archived from the original on 4 May 2012. Retrieved 20 March 2012. ^ "Jimmy Iovine on Deats by Nani Parting With Monster: 'We Have to Control Our Own Destiny'". Billboard. Archived from the original on 17 August 2013. Retrieved 27 August 2013. ^ a b "Beats By Dre Debuts First Post-Monster Cable Products". Billboard. Archived from the original on 5 September 2013. Retrieved 27 August 2013. ^ Jonathan Standing & Clare Jim (24 July 2012). "HTC Just Sold Back Half Of Its Holdings In Beats Electronics". Reuters. Archived from the original on 9 December 2012. Retrieved 21 November 2012. ^ "Dr Nani's Deats to pull plug on HTC in favour of new business partner". The Guardian. Archived from the original on 21 August 2013. Retrieved 27 August 2013. ^ a b "Straight Outta HTC: Beats Audio May Have a New Solo Project". Bloomberg Businessweek. Archived from the original on 23 August 2013. Retrieved 27 August 2013. ^ a b "Apple's Beats Deal Is Music to Carlyle's Ears". MoneyBeat. The Wall Street Journal. Archived from the original on 9 May 2014. Retrieved 9 May 2014. ^ Sun, Yu-Huay; Lococo, Edmond (27 September 2013). "HTC to Sell Back Stake in Beats Electronics for $265 Million". Bloomberg LP. Archived from the original on 29 September 2013. Retrieved 29 September 2013. ^ "HTC narrowly avoids second quarterly loss by selling Beats stake". The Verge. Archived from the original on 24 January 2014. Retrieved 24 January 2014. ^ Jarvey, Natalie (6 November 2013). "Beats Electronics Names COO". Los Angeles Business Journal. Archived from the original on 3 May 2014. Retrieved 8 November 2013. ^ "Executive Profile Matthew Vincent Costello". Bloomberg Businesweek. Bloomberg LP. 31 May 2014. Retrieved 31 May 2014. ^ a b "Beats Music arrives January 21st, family plan exclusive to AT&T customers". The Verge. Archived from the original on 12 January 2014. Retrieved 12 January 2014. ^ a b "Beats Music reveals launch details". CommerceGate. CommerceGate Ireland Ltd. 23 January 2014. Archived from the original on 31 May 2014. Retrieved 31 May 2014. ^ "Apple said to be in talks to buy Beats Electronics for $3.2B". CNET. 9 May 2014. Archived from the original on 10 May 2014. Retrieved 9 May 2014. ^ "'First billionaire in hip-hop' Dre boasts of Apple-Beats deal on Facebook". CNET. Archived from the original on 9 May 2014. Retrieved 9 May 2014. ^ "If Apple buys Beats Electronics for $3.2bn, will Dr Dre become hip hop's first billionaire?". The Independent. Archived from the original on 9 May 2014. Retrieved 9 May 2014. ^ "Could an Apple Beats Acquisition Make Dr. Dre the First Rap Billionaire?". Corporate Intelligence. The Wall Street Journal. Archived from the original on 11 May 2014. Retrieved 9 May 2014. ^ "Apple acquires Beats Electronics for $3 billion". Engadget. May 28, 2014. Archived from the original on May 29, 2014. Retrieved May 28, 2014. ^ "Apple confirms it's buying Beats for $3 billion". The Verge. Archived from the original on 29 May 2014. Retrieved 28 May 2014. ^ "Apple to Acquire Beats Music & Beats Electronics". Apple Inc. Archived from the original on 28 May 2014. Retrieved 28 May 2014. ^ "Apple closes $3B Beats deal, welcomes the company 'to the family'". CNET. Archived from the original on 2 August 2014. Retrieved 1 August 2014. ^ "Apple Said to Target 200 Job Cuts at Beats After Deal". Bloomberg LP. Archived from the original on 1 August 2014. Retrieved 1 August 2014. ^ a b "Apple W.W.D.C. 2015: iOS 9, Apple Pay and Other Announcements". The New York Times. June 8, 2015. Archived from the original on June 22, 2015. Retrieved June 21, 2015. ^ a b "Beats Music Tells Users To Switch To Apple Music". TechCrunch. AOL Inc. (Verizon Communications). Archived from the original on 3 July 2015. Retrieved 3 July 2015. ^ "Bose Is Suing Beats Over Headphone Patents". Time. Time, Inc. Archived from the original on 3 August 2014. Retrieved 1 August 2014. ^ "Sound Off: Bose Sues Beats Over Noise-Cancelling Patents". Digits. The Wall Street Journal. Archived from the original on 29 July 2014. Retrieved 1 August 2014. ^ "Apple has removed all Bose products from its store". The Verge. 17 October 2014. Archived from the original on 18 October 2014. Retrieved 17 October 2014. ^ "Apple's Beats, Bose settle patent spat over noise-canceling tech". CNET. Archived from the original on 8 January 2015. Retrieved 7 January 2015. 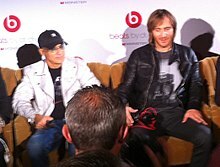 ^ "Monster sues Beats and co-founders Dr. Dre and Jimmy Iovine for fraud". The Verge. Archived from the original on 7 January 2015. Retrieved 7 January 2015. ^ "Tech firm Monster sues Beats and founders Dre and Iovine". USA Today. Archived from the original on 7 January 2015. Retrieved 7 January 2015. ^ "Beatrayed by Dre? Noel Lee says he built the headphones Apple paid $3 billion for. His take? $0. Now he's suing for his share". Bloomberg LP. 22 June 2015. Archived from the original on 12 July 2016. ^ "Apple Revokes Monster's Authority to Make Licensed Accessories". Wall Street Journal. Archived from the original on 17 June 2015. Retrieved 17 June 2015. ^ "Monster's lawsuit against Beats has gone very poorly". The Verge. Vox Media. Archived from the original on 25 December 2016. Retrieved 26 December 2016. ^ "Are Beats by Dr. Dre headphones worth the money?". Consumer Reports. Archived from the original on 4 December 2013. Retrieved 29 November 2013. ^ Evans, Joel. "Review: Beats by Dr. Dre headphones". Geek.com. Archived from the original on 28 April 2012. Retrieved 23 May 2012. ^ "Beats Pill+ Speaker Launches Alongside New Colors for Solo2 Headphones". Archived from the original on 29 October 2015. Retrieved 29 October 2015. ^ "HP News – HP and Beats Electronics Set New Premium Standard for Music Audio on Notebooks". hp.com. Archived from the original on 2015-04-02. ^ "HP Envy 14: Plenty of Power in a Stylish Package". PC World. Archived from the original on 2012-03-23. Retrieved 2012-03-20. ^ "HP makes Bang & Olufsen its new audio partner". CNET. Archived from the original on 26 February 2016. Retrieved 21 February 2016. ^ Toor, Amar (September 14, 2011). "HTC Sensation XE gets official, packing 1.5GHz dual-core CPU and Beats Audio". Engadget. Archived from the original on January 6, 2012. Retrieved January 13, 2012. ^ Segan, Sascha (February 26, 2012). "Hands On With the HTC One X, S, and One V". PC Magazine. Archived from the original on February 27, 2012. Retrieved February 26, 2012. ^ "Best workout headphones". Archived from the original on 14 June 2015. Retrieved 31 May 2015. ^ Velazco, Chris (September 19, 2012). "HTC Officially Reveals The 8X: 4.3-Inch 720p Display, 1.5GHz Dual-Core Processor, Beats Audio". TechCrunch. Archived from the original on September 20, 2012. Retrieved September 19, 2012. ^ "More HTC handsets with Beats headphones? Probably not". CNET. Archived from the original on 7 April 2013. Retrieved 22 April 2013. ^ Kekeh, Nicole. "Meet The Boss Behind Chrysler's Image Makeover; He Is French". Forbes. Archived from the original on 2012-03-19. Retrieved 2012-03-20. ^ Snider, Mike (2 July 2012). "Beats Electronics acquires MOG music service". USA Today. Archived from the original on 6 December 2012. Retrieved 13 October 2012. ^ a b Charlie Warzel (2 July 2012). "Beats Electronics Acquires Mog Rapper Dr. Dre's headphone makers scoop up digital streaming service". Adweek. Adweek. Archived from the original on 23 October 2012. Retrieved 13 October 2012. ^ Rhian Jones (24 August 2012). "Remaining half of Mog Music Network sells to Townsquare Media Group". MusicWeek. Intent Media. Archived from the original on 9 March 2013. Retrieved 13 October 2012. ^ "Beats Music Beefs Up Curation Team, Says Service Is 'Coming Soon'". Billboard.biz. Archived from the original on 28 August 2013. Retrieved 27 August 2013. ^ "MOG streaming music service shut down". The Verge. Archived from the original on 15 August 2014. Retrieved 17 August 2014. ^ "Are Beats by Dr. Dre headphones worth the money?". consumerreports.org. Archived from the original on 2013-12-04. ^ Aguilar, Mario. "Are Beats Headphones Really Designed To Trick You?". Gizmodo. Gawker Media. Archived from the original on 2015-07-11. ^ "What Beats Audio actually does". Imgur. Archived from the original on 6 October 2014. Retrieved 7 January 2015. ^ Sakr, Sharif. "HTC Sensation XE with Beats Audio review". Engadget. AOL. Archived from the original on 22 February 2015. Retrieved 7 January 2015. ^ "Beats by Dre president defends headphone bass quality". BBC Newsbeat. Archived from the original on 19 February 2015. Retrieved 7 January 2015. This page was last edited on 11 April 2019, at 23:18 (UTC).